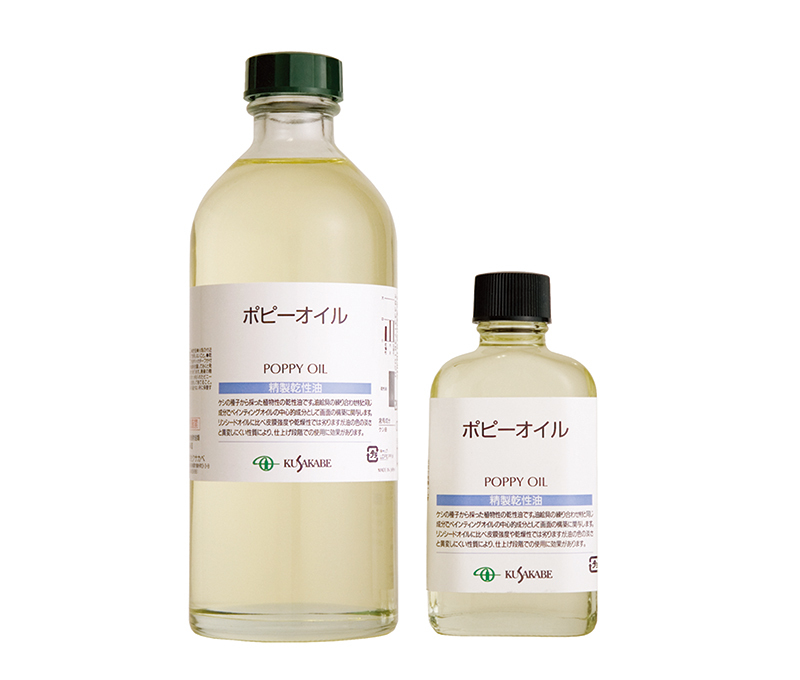 Poppy seed oil is an oil painting medium used in the production of oil works to improve the fixing capacity, adjust the viscosity and concentration, and enhance the glossiness of the paint. It is also included as a pigment fixing component (main vehicle) in oil paint. Painting mediums used in oil colors comprise mainly two types: volatile and dry oil. 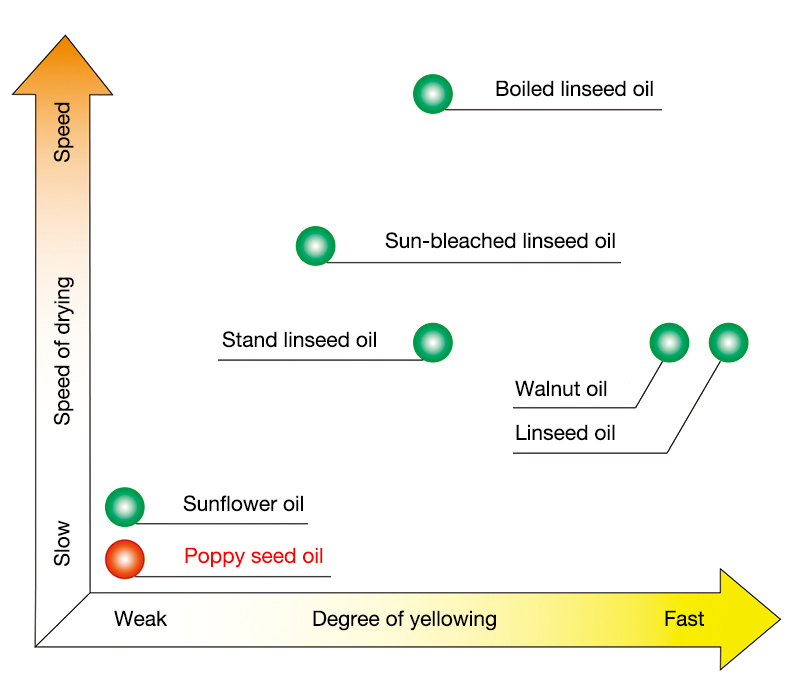 Poppy seed oil is classified as dry oil and it hardens when its unsaturated fatty acid content combines with oxygen resulting in oxidative polymerization. It is a plant-based dry oil, which is extracted from poppy seeds and then distilled, containing a large amount of linoleic acid, and dries slightly more slowly than linseed oil. Because it is not prone to yellowing, it is suitable for use in mixing with white and other pale colored paint. 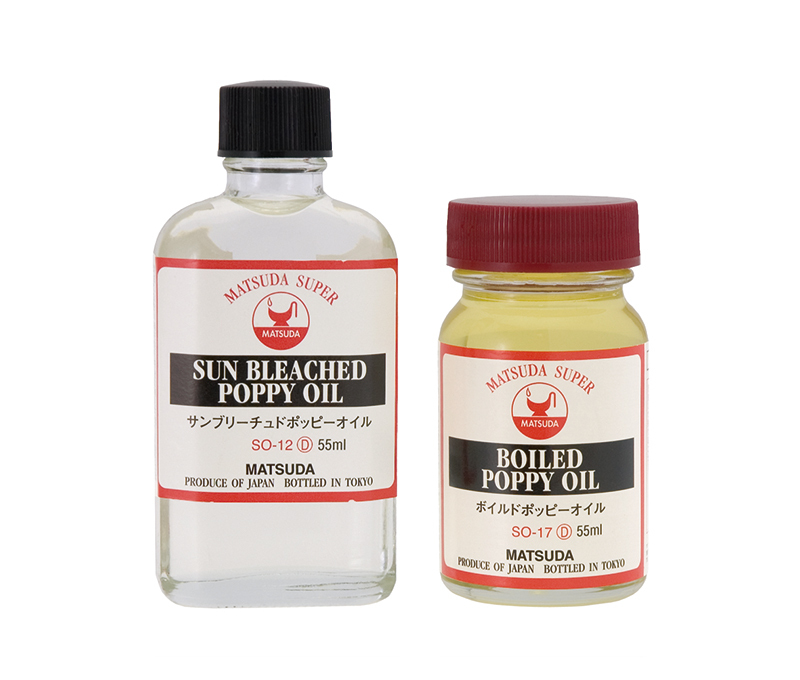 There is also a processed form of this oil known as “sun-bleached (or sun-thickened) poppy oil” made by exposing the oil to sunlight over extended periods, which dries more quickly, is more glossy and transparent, and forms a durable coating. To use, add a solution of poppy seed oil diluted with turpentine or some other volatile oil to a font or some other container, dip the tip of a brush into the solution when required, adjust to the required viscosity and concentration by combining this with the oil paint on the brush tip and then begin painting. The solution will have more volatile oil and less dry oil when the painting begins but the ratio of dry oil will gradually increase as the work continues. When using poppy seed oil the environments should be well ventilated and the oil should be kept well away from hot environments or naked flames. Poppy seed oil can be purchased at general art supply stores.